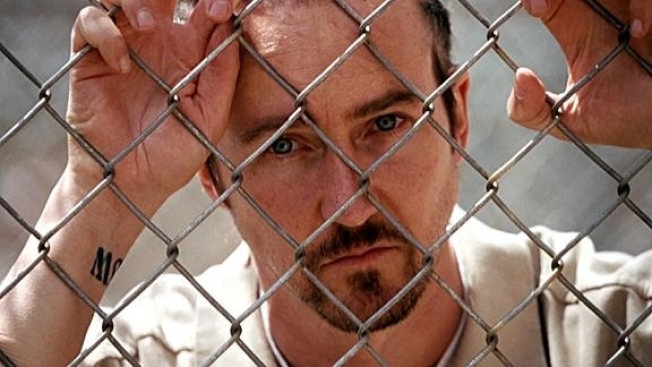 Edward Norton is an undeniably brilliant actor. So when he decided to go gangsta, sporting cornrows, saying "axe" instead of "ask" and throwing out lines like, "I don't want no beef, I just wanna be vegetarian," for his latest film, "Stone," his "choices" were applauded. Rightly so, and Norton's performance as Gerald "Stone" Creeson, an imprisoned arsonist who enlists his wife Lucetta (Milla Jovovich) to help him manipulate his parole officer, Jack Mabrey (Robert De Niro) into helping him win his freedom, is, as always riveting. That's not the problem. The problem is the movie in which the performance can be found. Overwrought and ham-fisted, "Stone" is a film less about performance than it is sound design. Director John Curran, who previously worked with Norton in 2006 on "The Painted Veil," thuds away on the film's religious and moral overtures with the subtlety and elegance of a five-year-old trying to hammer out Mozart on a Wurlitzer. Running a constant stream of Christian talk radio and the deafening buzz of insects, Curran explores the "sound of God," but all you hear is the director's mind working overtime at creating atmosphere and forgetting plot. That's not to say the acting isn't atmospheric and exemplary. But what else would you expect from this cast? Norton and De Niro previously starred in 2001 on "The Score," a film which features Marlon Brando's last big screen appearance. Watching them work together for a second time, in a volatile cat-and-mouse game, is the film's greatest strength, though you can't help but yearn for better circumstances for such fine actors. Meanwhile, Milla Jovovich as human catnip, the consummate femme fatale, is enrapturing and tragic, but squandered on a script that goes nowhere, and Frances Conroy as Madylyn, Jack's long suffering, heavily sauced wife, is a portrait of silent pain. But great acting can't save "Stone" from Angus MacLachlan's script, adopted from his own play though still stuck on a proscenium, or Curran's direction. Norton began his career with exacting precision. From his brilliant Oscar-nominated debut in 1996's "Primal Fear" until 2003’s "Italian Job," Norton’s sole career misstep was "Death to Smoochy," which gave him the chance to go mano y mano with Robin Williams and, in retrospect, is rather enjoyable. Who knows if it was the studio breaking his spirit by forcing him to appear in an action movie he didn't want to do ("Italian Job") or just film fatigue but, since 2005, with the exception of "The Illusionist" and "The Incredible Hulk," Norton has made a string of shabby choices. "Stone" sadly continues that trend.